The water was unbelievably clear. 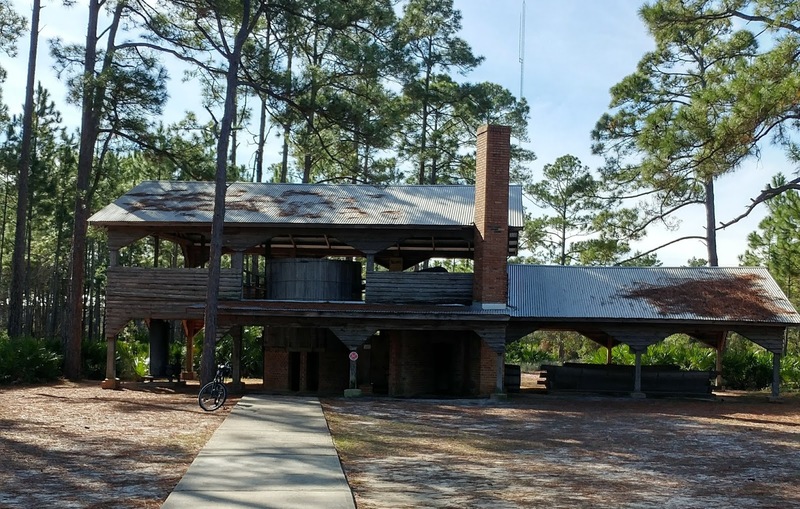 We revisited St. Andrews State Park in Panama City Beach, Fl. between Christmas & New Year's Day. Things were very much the same as last year, except the weather. This year was cold, rainy, and windy, but we made the best of it. We had 2 days of warmer weather, and we didn't let the bad weather deter us. We brought bikes with us this year and we rode almost every day. We had to bundle up, but we took some nice rides. CH & I 💖💖💖 the beach in winter. 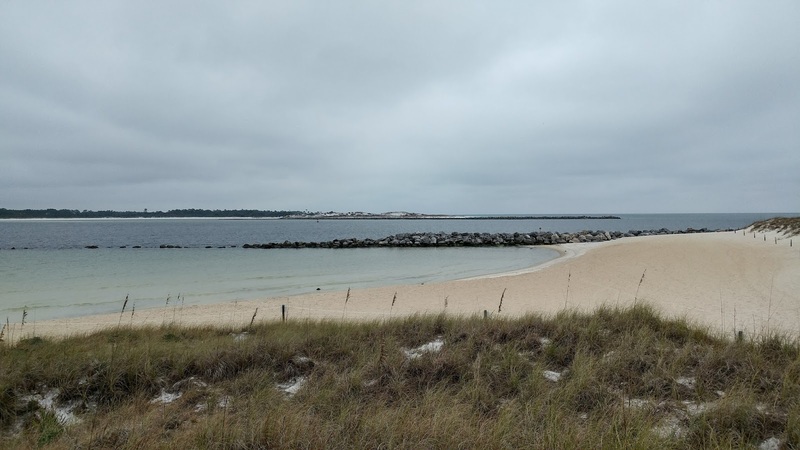 Most people I know don't even think about the Florida Panhandle for a winter vacation, but we absolutely love it. 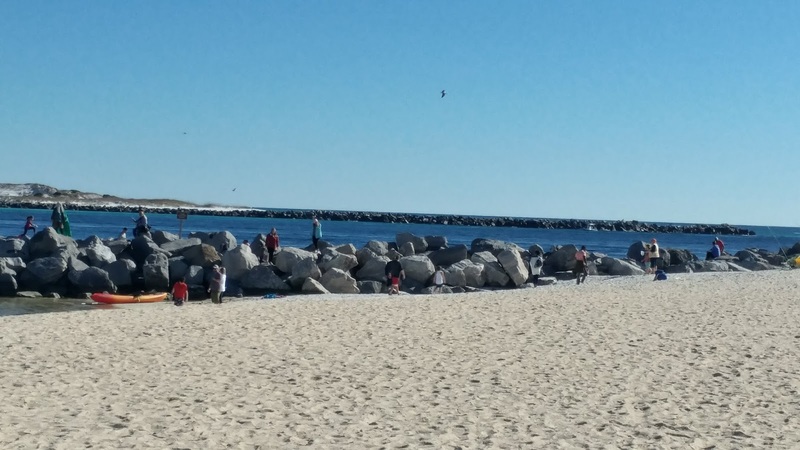 The jetties on a cold day...not a soul in sight! 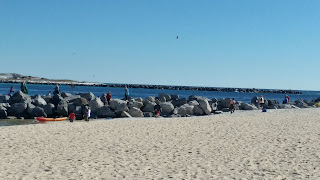 The jetties on the warmest day we had...some people, but not nearly as many as spring/summer! 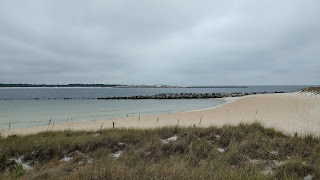 The first day we were there was unusually cold and rainy. We stayed in our little trailer most of the day. CH caught up on a lot of sleep; I caught up on computer time and reading. In fact, the whole time we were gone I finished a book that I had started a while back and read 2 whole books. I finished the book Sweet Tea and Southern Grace (Glenda C. Manus)...it was one of those no-brainer, fairly predictable books that I started reading last summer. I only finished it because I had started it and I hate to not finish something I start. The other 2 books were excellent: The Girl with No Name (Diney Costeloe) and The Hangman's Daughter(Oliver PÖtzch). If you like WWII/holocaust era books or are a bit obsessed with that history as I am, then you'll like The Girl with No Name. I couldn't put it down. The Hangman's Daughter's title is a little deceiving because the book wasn't fully about her; she was a minor character. This book takes place in 1600's Germany & is just fascinating. The author is a descendant of the main character (the executioner), but the book is fiction. 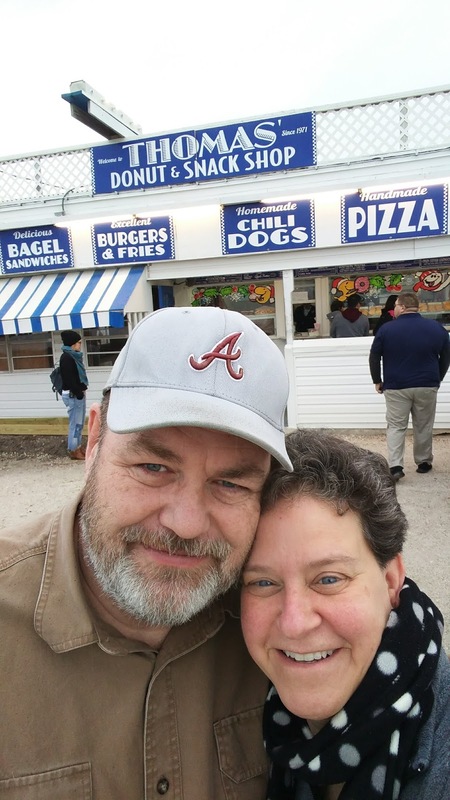 The first order of business was getting breakfast from the best donut place in the world (or at least the Southeast U.S.A.): Thomas Donuts. We also waited all year to go back to Dat Cajun Place. We found it last year and were glad to see it is thriving. 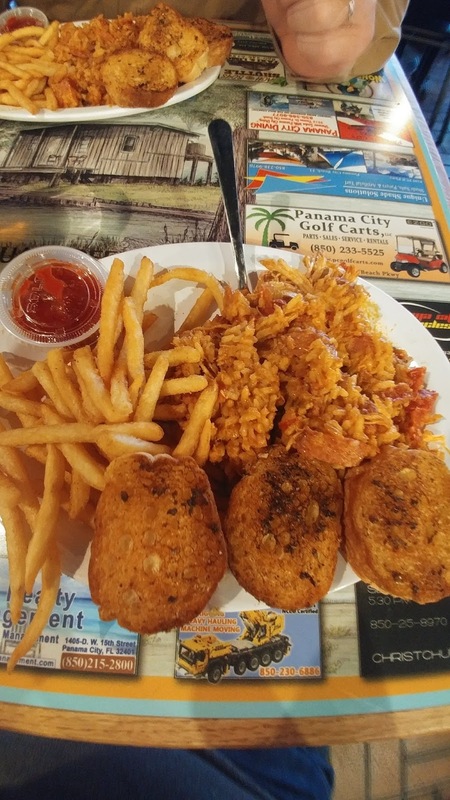 I had the chicken jambalaya plate...which was delicious. 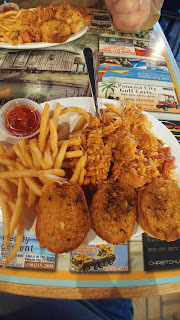 Really good Cajun food that isn't too spicy...at least mine wasn't. Great atmosphere and fantastic food. If you go, make sure you have plenty of time...it definitely isn't a fast food joint. It's a great place to watch football and have a beer...or two. 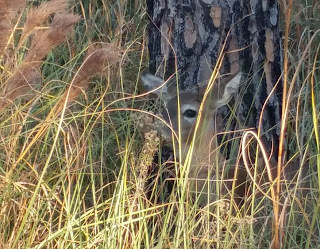 While I was watching it, a deer came within 10 feet of me (it may have been closer...I'm horrible at looking at something and estimating how far away it is.) 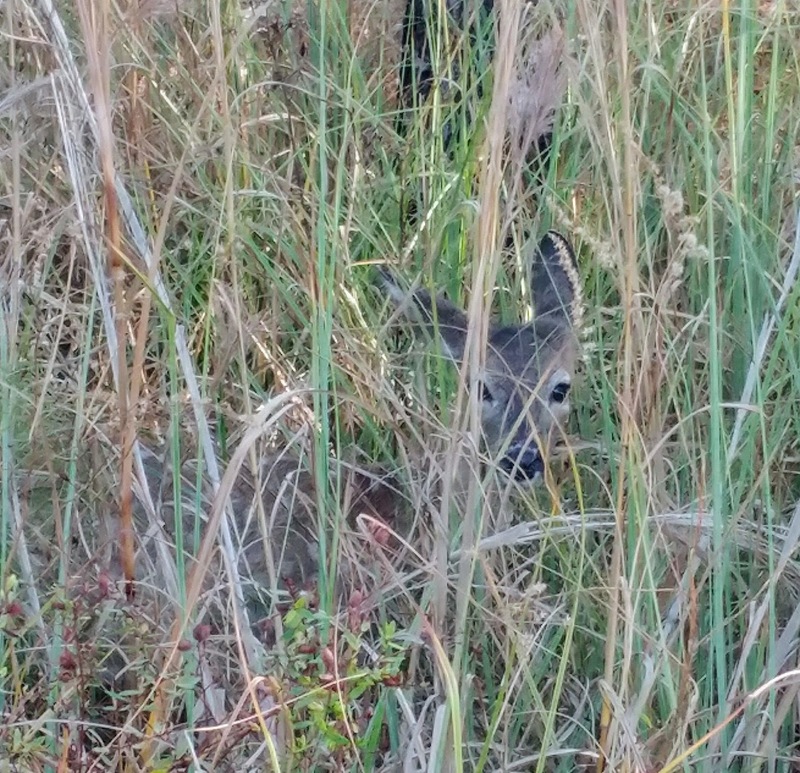 She looked at me, then slowly walked into the swampy area. We also came across a turpentine still while riding our bikes. As many times as CH has been to this park, he didn't know it was there. According to the history of St. Andrews State Park, this is a replica of a turpentine still "from the turpentine era when turpentine and rosin were indispensable to Naval stores." This turned out pretty well. 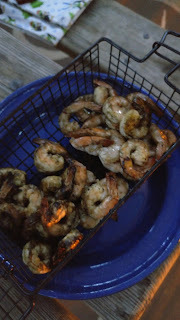 Of course, we had to have fresh shrimp one night. 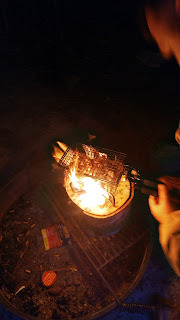 CH wanted to try cooking over a Swedish Fire Log, so we tried that. 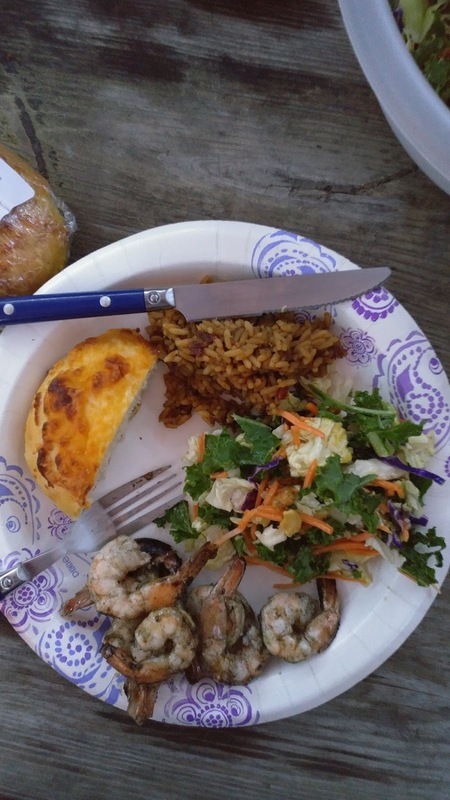 We had a little basket that was perfect for the shrimp. 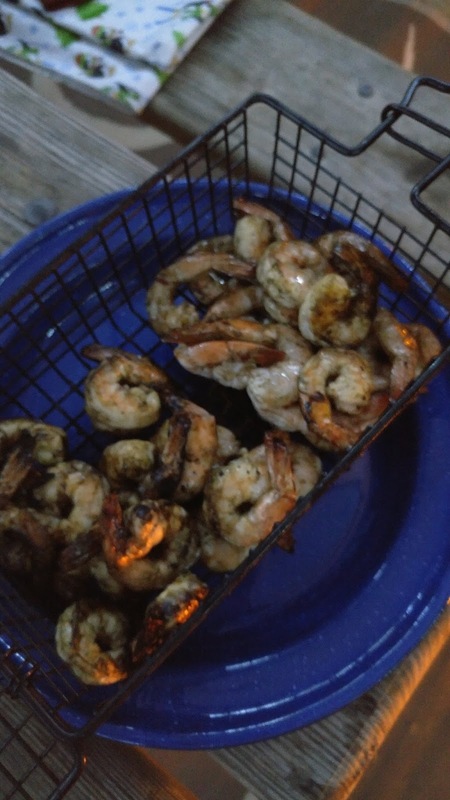 Shrimp were ready to eat! They cooked really quickly with CH shaking and turning them constantly. Here's the thing: I could taste gas on them. I don't know if it was the gas they put on the wick that is in the middle or what, but I was not a fan & I love shrimp. I'm very picky about what is cooked with gas because I swear I can taste the gas in some things that we cook while camping...mostly it's vegetables. We know not to cook it that way again! The log was pretty neat...once we got it going. We'll definitely get another one of those again. It burned just about the right amount of time for us. 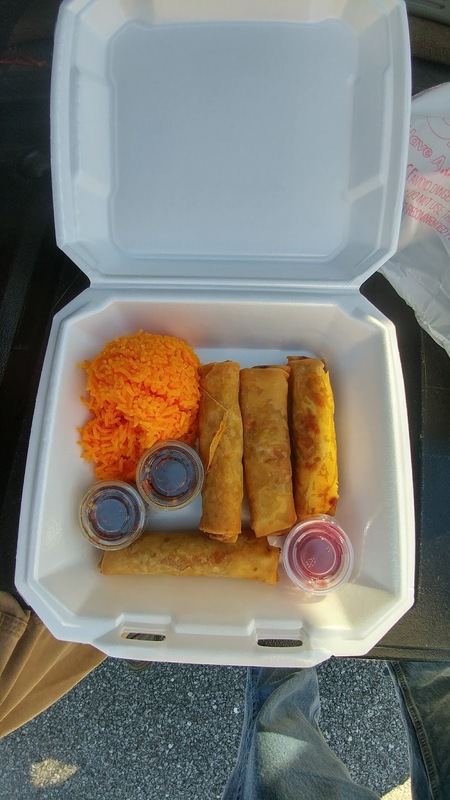 CH's was served with rice. 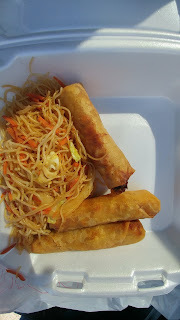 MIne had a kind of pasta called pancit. 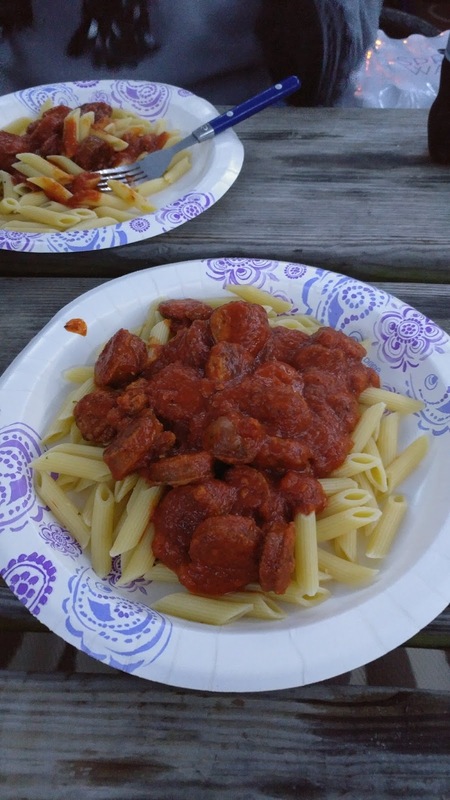 The sauce was amazing! It was so good that after we had a sample we started walking to the parking lot. I stopped to buy some more sugar scrub that I bought last year when we were there. CH said he was going back to buy lunch, so we turned around and had lunch. A very nice couple own the store; he is in the Navy but I think they have plans to market the sauce. 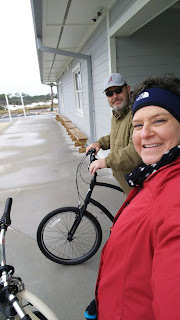 We only had one day when it was warm enough to take off my sweatshirt & just have on a long-sleeved t-shirt, so we took advantage of it by riding our bikes to the beach and taking a stroll. Finally some sun and warmth! 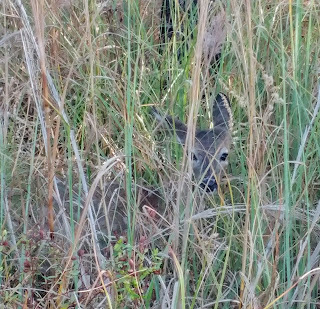 Since we were riding our bikes we got to see a mama deer and her baby who were hiding in the grass. 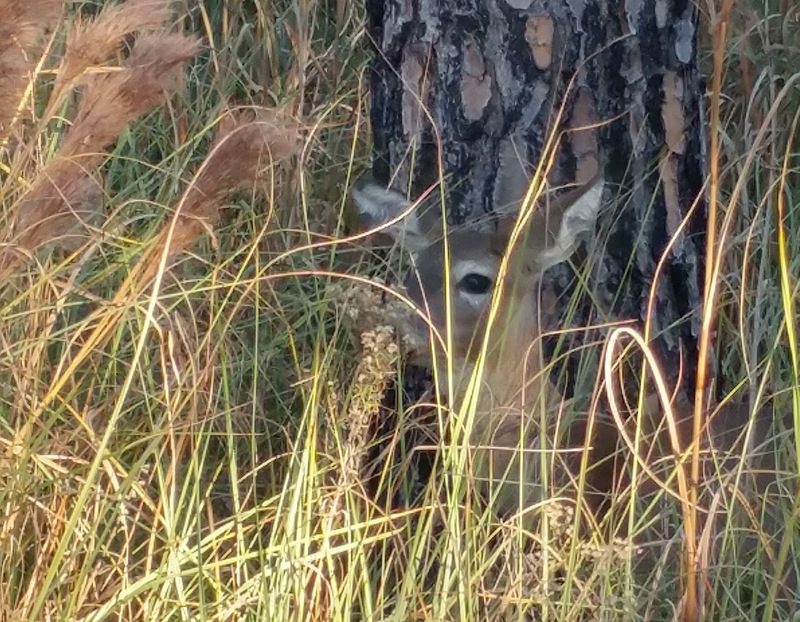 We watched her for a long time...until a lot of cars started stopping to see them. The baby still had her/his spots. We only had a couple of pretty sunsets. We missed the first one because we were driving back to the park after visiting with my in-laws' friends, but the second one made up for it. The pink hues were gorgeous! I took this picture from the edge of our campsite. As I mentioned in last week's Hodgepodge, the family that came in next to us was super nice. I was pleasantly surprised to learn that she is a blogger. With it being so cold and rainy, we didn't have a chance to talk very much. They originally were going to camp with some friends of theirs, but the friends didn't make it because of illness. They made reservations at a restaurant for New Year's Eve and didn't change it, so they invited us to dinner. We said yes, but we made the huge mistake of going to Dat Cajun Place for lunch. We ate way too much, and the weather was cold, rainy, and extremely windy, so we opted to stay in our cozy little trailer. (We're partiers that way!) We got up the next morning, packed up in some extremely heavy wind, and headed to CH's parents' house to spend the day. The next morning we were back on our way home. All in all, a wonderful, relaxing vacation! Looks like it was a great way to herald the new year! Great pictures, btw!! 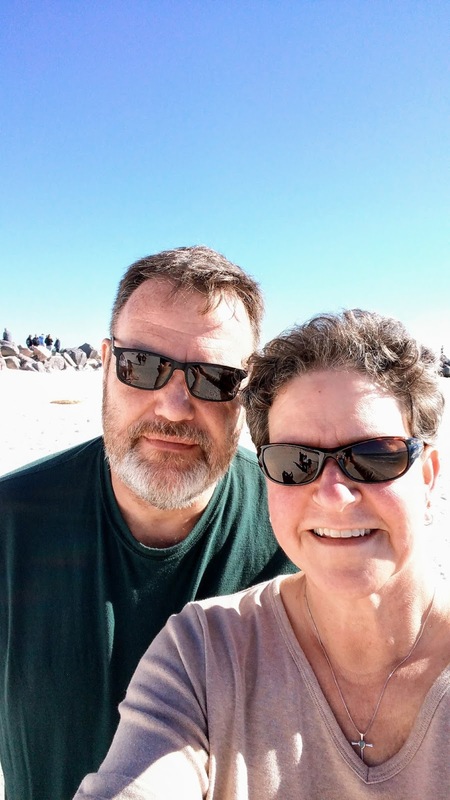 Sure sounds like you had a great time in spite of the cold weather! The panhandle is really pretty and the beaches beautiful. You really can't beat the Gulf beaches (in my opinion)! Your pictures look beautiful, the weather description sounds like here ! Strong wind, rain and cold ! I always enjoy reading about your travels. Someday... I really look forward to David and I being able to do this! You'll get there! We hardly went anywhere when our boys were younger! Looks like you had a great time despite the weather. The food looks delicious and the photos are awesome! So glad you were able to get away for a few days.